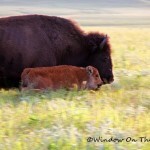 A couple weeks ago we saw the bison herd at the Tallgrass Prairie National Preserve for the first time since mid-June. They were resting near the trail so we stopped and watched them for about a while. On our last visit, the first calf of the summer was just a month old and probably only weighed about a hundred pounds then. Here’s how it looked back in June. He has shed his baby light brown coat for a dark brown one and has grown a great deal over the summer, probably weighing in at about 500 pounds. Here he is today on the left. And he’s been joined by another baby calf, born in early July. (above right, and below). 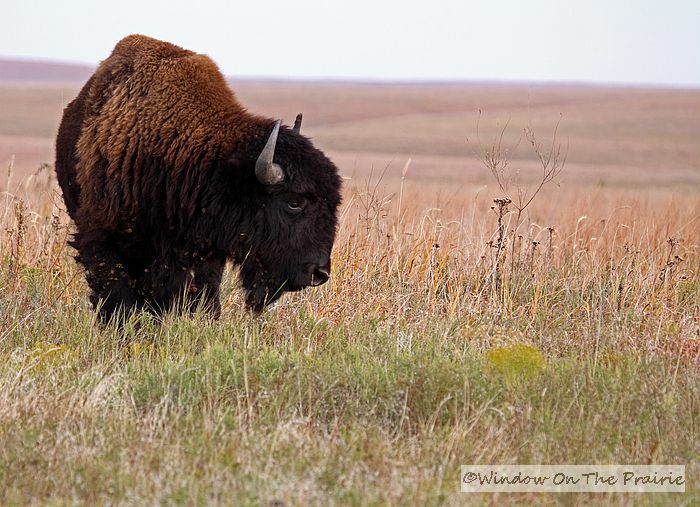 Bison enjoy a good dust bath regularly, and will use the same areas repeatedly eventually creating a depression in the ground, or wallow. 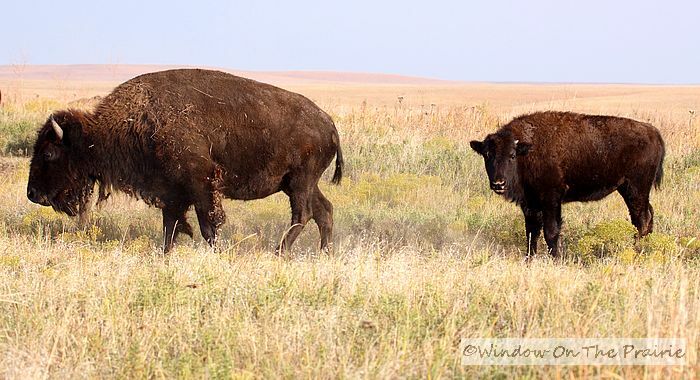 Above, a bison cow takes a dustbath while her calf watches. Finally, the cow finished, got up and walked away. 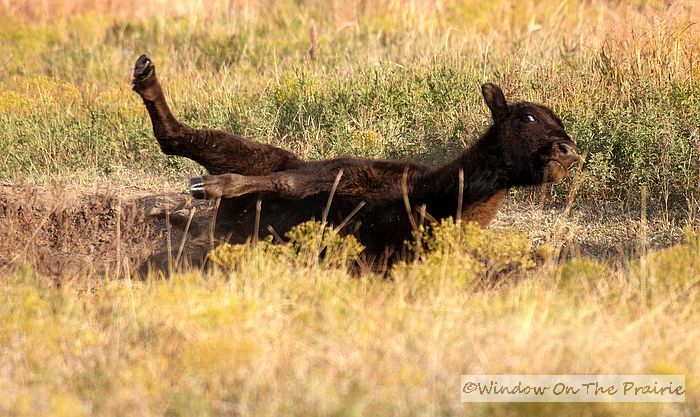 Then the calf, imitating its mother, took its own dustbath. 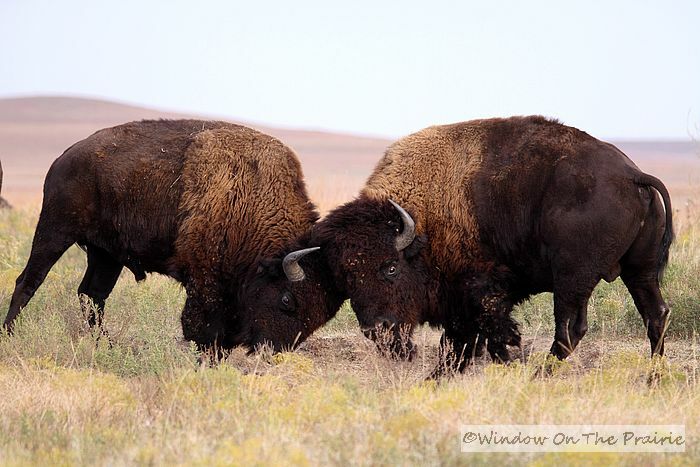 We also watched as two of the bison bulls engaged in a shoving match. They weren’t really fighting, but just kinda testing each other out. The two calves are almost the same size and age and so they make good playmates for each other. Here, they have a shoving match of their own, albeit on a smaller scale than the bulls. It’s so fascinating to watch the herd and how they interact with each other. —–> Tomorrow, I’ll share a video I took of them while there. 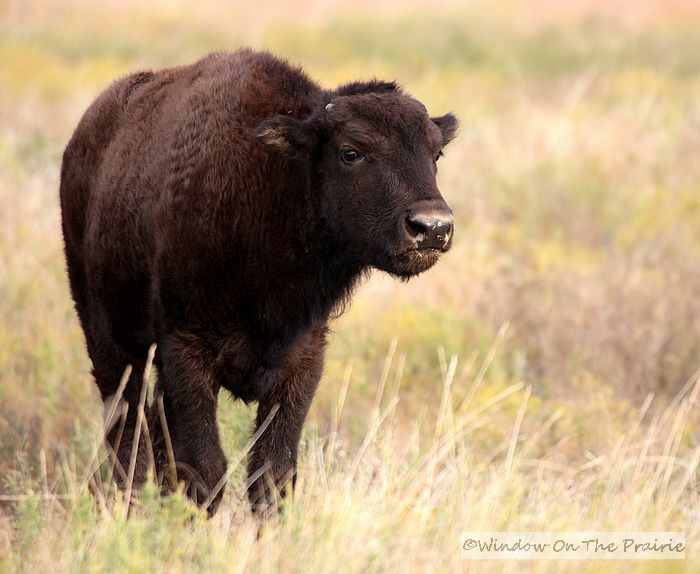 The bulls do a little fighting, the calves play with each other, and a young bison comes in for a very close look at me. Can not wait for your video. Bet its going to be exciting. You have some wonderful photos here. Those calves sure put the weight on. Isn’t it kinda scary being so close to them? A little. I have a telephoto lens so I’m not as close as it looks. Sometimes they come up to me though and then I back away. 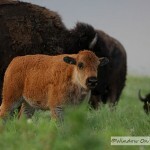 I lughed at the look on the younger bison doing the dust bath. He had a wild look in his eye kind od like…”is this the right way to do this, Mama”? One of the bulls in the shoving match also had a “hey watch it with that horn” look!! Ha ha! I wondered when watching the bulls if they ever poke each other’s eyes out with those pointy horns. Yikes. Wonderful photos! A dust bath sounds hilarious! 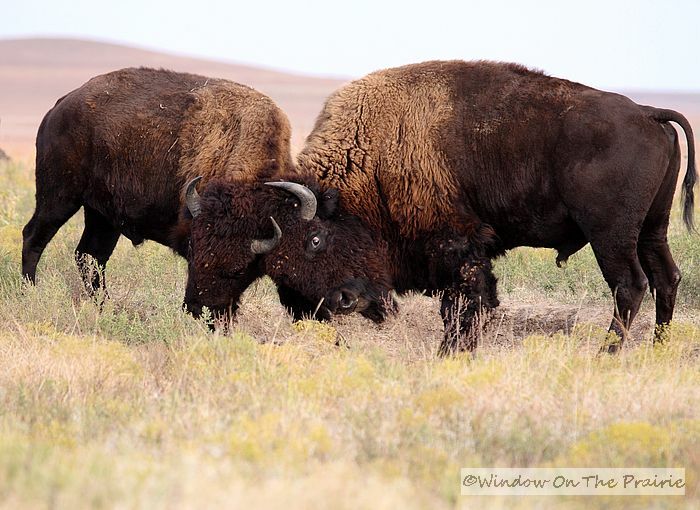 Your photos have allowed me to see bison way closer than ever before; many thanks. 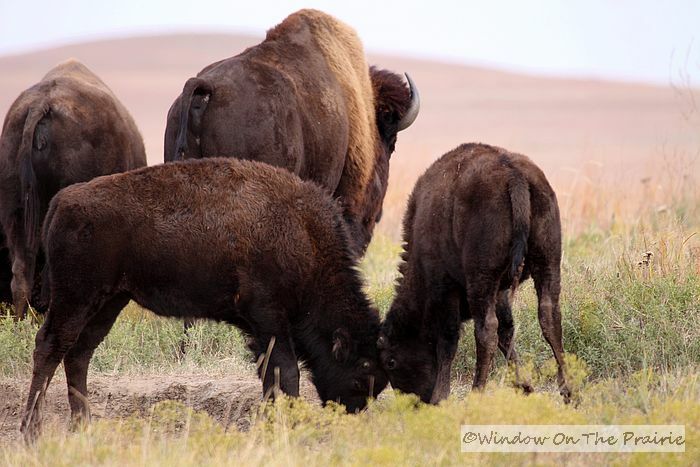 In summer 1982 on our way thru Yellowstone we saw Bison from several hundred feet and I harvested a bit of their fur from a tree they had recently passed and rubbed against. 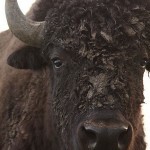 Thank you for the close up view of a day in the life of a Bison! 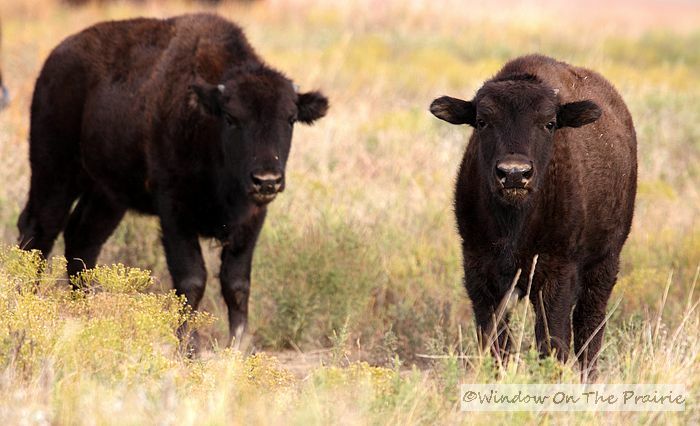 I love that the calf imitates his Mother and the bulls. Nothing like a good dust bath and a shoving match to make your day, I say! 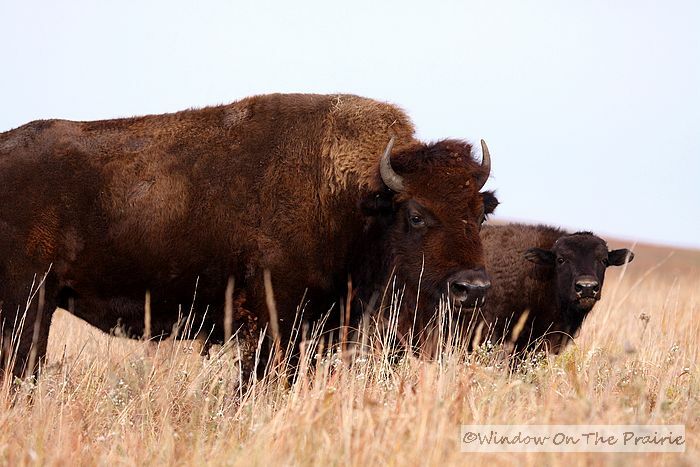 Thanks for sharing the wonderful bison photos. I am just impressed with your work. 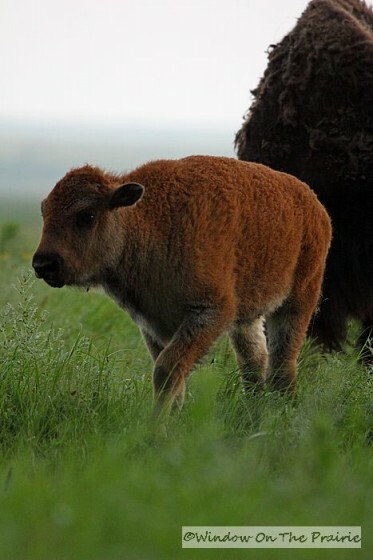 My how the bison calf has grown and so different looking, more grown up. This a.m. I went out to take mail to box. 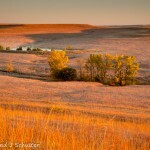 It was foggy and what made it better was the red/orange tree that brightened the scene. Even though I had to go in for breakfast b4 work, I got my Canon and took a few shots and am hoping they turn out good. I couldn’t let that scene escape. I plan to post it soon. I guess that’s what us photographers do, huh? And it’s fun sharing them as well. Hugs and have a good day. 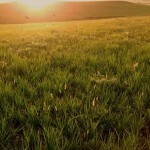 That’s why I started this blog is to share photos and experiences. Thanks Becky. 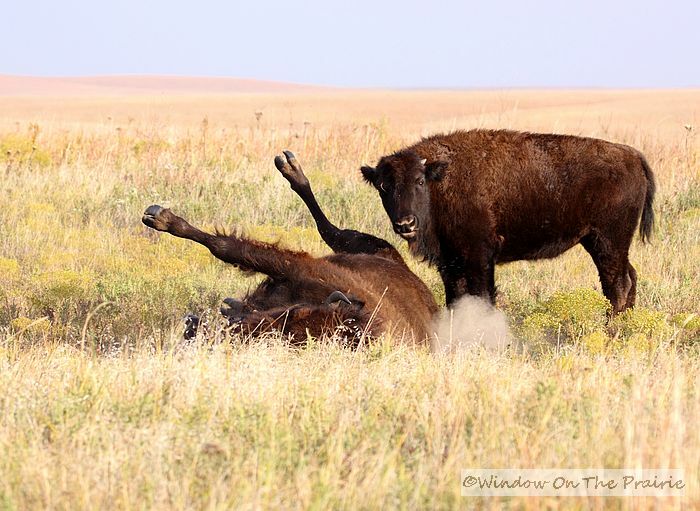 I love the picture of the Fighting Buffalo, especially the one under it you wrote, not really fighting, just kinda testing each other out. Are copies of the pictures for sale?